It's the 16th Annual Pleasure Island Chowder Cook-Off, Folks! Mark your calendars for Saturday, April 14th, and head to Carolina Beach, NC to sample some of the best chowder around! The Chowder Cook-Off is fun for all ages, and is held every spring at Lake Park in Carolina Beach, NC. Gates open at 11:30 a.m., the band starts at noon. Local restaurants from Carolina Beach, Wilmington, and Monkey Junction all compete for a shot at becoming “Chowder Champ”. 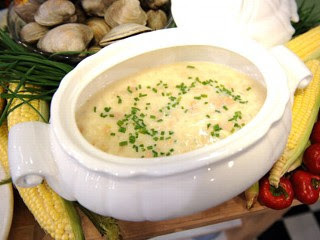 One chef from each participating restaurant crafts a signature chowder for a public tasting and vote! Chowders range from “traditional” to “creative”, so surely there will be one to please your palate! In addition to serving up the area’s best chowder, this daylong event includes live music and the Kidz Zone which will have face painting, balloon art, and a 3 in 1 inflatable house. There will also be hotdogs, funnel cakes, soft drinks and beer and wine for sale. (No coolers, no pets please!). Chowder, Live Music, Games for the Kids…need we say more? Book your stay at the Beacon House today – 910.458.6244. This entry was posted in Carolina Beach, Dining, Family Friendly, Restaurants, Spring Event, Spring Events, Wilmington by admin. Bookmark the permalink.